Want to know what happens when colour blocking makes the leap from catwalk to cake? Something totally stupendous, as you’re about to find out! 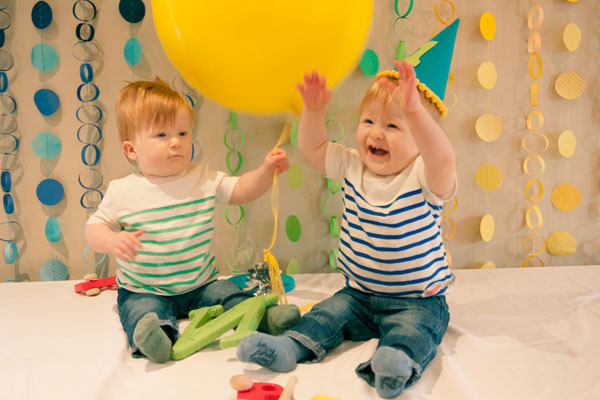 Melbourne mum Beth tells us she was inspired by her twin boys’ wardrobes when settling on a theme for their first birthday party recently. As an easy way of telling the boys apart in the early days, Aidan became the “blue” twin and Ollie the “green” one, a dress code of sheer convenience that has since stuck. 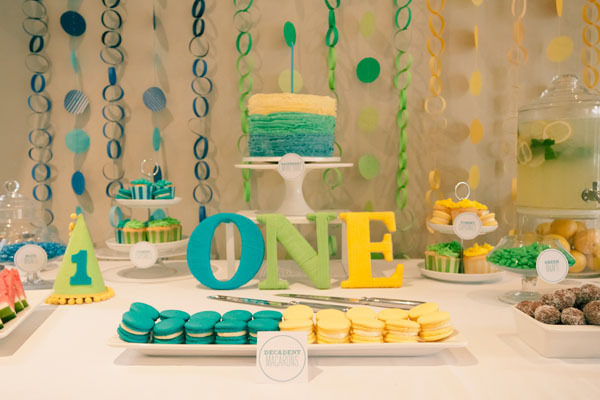 Add in the yellow walls of their shared nursery and there you have it – one spectacular party! 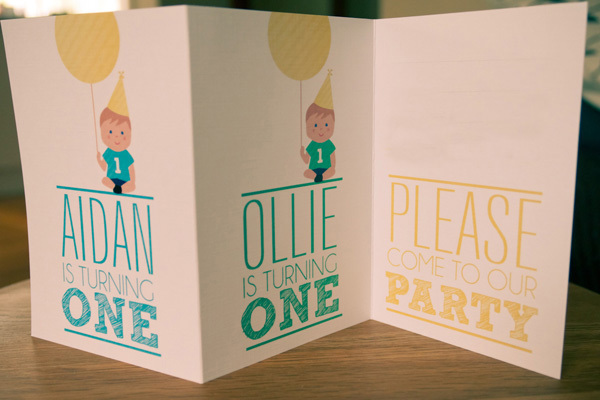 Beth, a digital art director, designed the rather lovely invites herself. 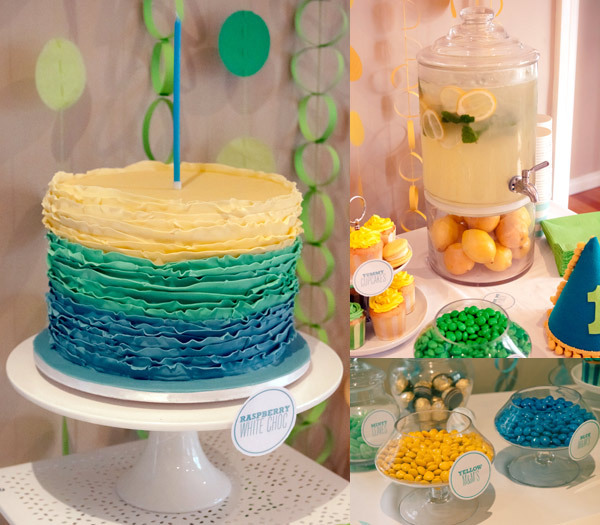 We love the cute stylised images of her boys and how she incorporated the green, blue and yellow party palette into things. We also love how the sketches of the boys clasping oversized yellow balloons were an unexpected harbinger to invited guests of things to come. Now have another look at the party table. Looks like a professional stylist went to town on it, yes? Not so. 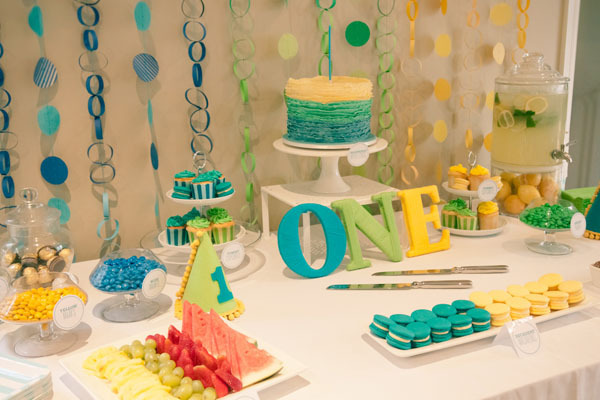 The eye-catching decorations – from the paper garland backdrops to the pompom-trimmed party hats to the yarn-wrapped letters spelling out ‘One’ – were all made by Beth, drawing inspiration from everyone’s favourite party-planning tool, Pinterest. 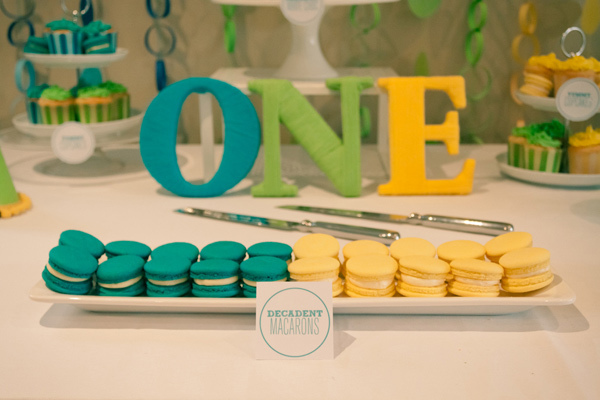 Beth so wanted to make the cake and macaroons herself too, but when disaster followed disaster with her test baking efforts, she finally admitted defeat and went to The Cake Company instead. That’s how her boys ended up with the be-all and end-all of ruffled birthday cakes – a divine white chocolate and raspberry number. Now how about this for a sentimental touch. Aidan and Olie’s grandfather had special cake knives engraved for each boy that read “Make your wishes, dream your dreams… and may they all come true”. They were used, with much ceremony, to cut the cake and will be used, we’re sure, for many more birthdays to come. While the birthday cake and macaroons, in all their passionfruit, jasmine and lime-flavoured loveliness, were outsourced, Beth and husband Michael did manage to make some very edible treats themselves, including cupcakes, cute fruit-topped custard tartlets and chocolate balls. Michael’s grapefruit punch was also a hit, served up in a fancy drinks dispenser shipped all the way over from Pottery Barn. Now remember those freckle-faced bubbas and oversized yellow balloons on the invitations? Here they are, come to life in the cutest possible way! Beth found the giant round balloons at one of my favourite online stores, Lark.